March 26, 2019The beauty of shared experience is that we feel the pain and fear in ways that others don't and can't. February 1, 2019Counterfeit Iclusig has been identified in Turkey, Argentina, Switzerland and sold online. November 27, 2018Nancy, thanks for making a difference. October 15, 2018Once you connect with a community, it's always a part of you. 7 pm-9 pm: Ottawa CML Group meet-up. Ottawa Regional Cancer Foundation, 1500 AltaVista Drive. Email t.harvey@rogers.com for more information and to RSVP. 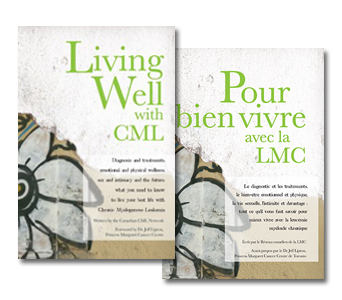 Conference: Living Well with CML – Toronto June 15 – Details to be announced shortly.